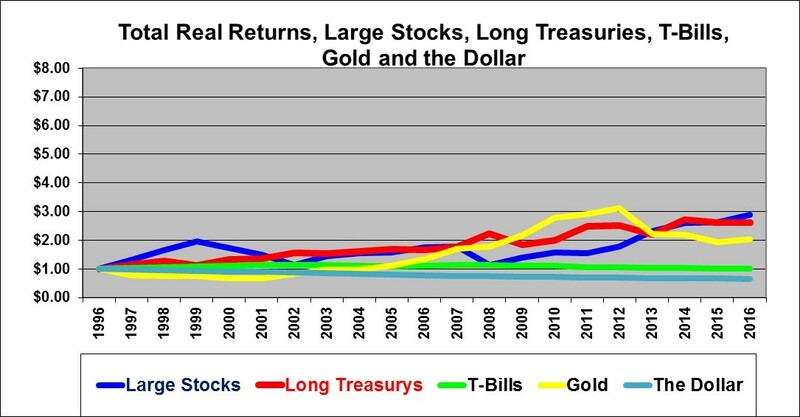 This article displays graphically the long-term historic performance and returns of the five major asset classes of U.S. stocks, U.S. long-term (20-year) government bonds, U.S. T-bills, Gold and cash (the U.S. dollar). The results are truly enlightening and amazing. The results are based on U.S. data from 1926 through 2016. The data source is a well-known reference book called “Stocks, Bonds, Bills and Inflation” 2017 edition. The book is published annually and is available through Wiley. The data for gold is from www.onlygold.com. Note that most analysis of historic returns that you have seen is horribly flawed in that it is based on “nominal” returns before inflation. The graphs and figures below are based on “real” returns after inflation. That is, this analysis shows the real increase in actual purchasing power generated by each investment asset class. 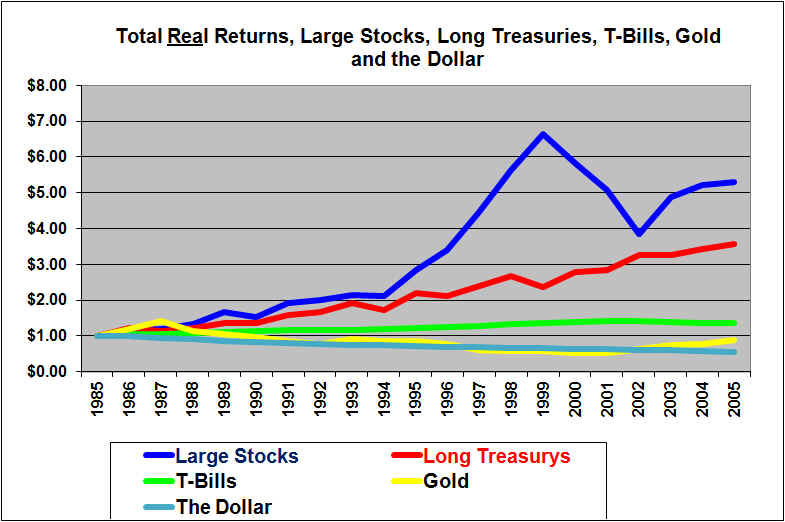 The graph below shows the long-term real (after inflation) returns on large capital U.S. stocks (The S&P 500 stocks), long term U.S. Treasury bonds (20 years), U.S. Treasury Bills (30-day cash investments), the real value of a U.S. dollar after inflation and Gold. The return is illustrated by showing the inflation-adjusted growth over the years of $1.00 invested in each asset at the end of 1925. Isn’t that amazing? 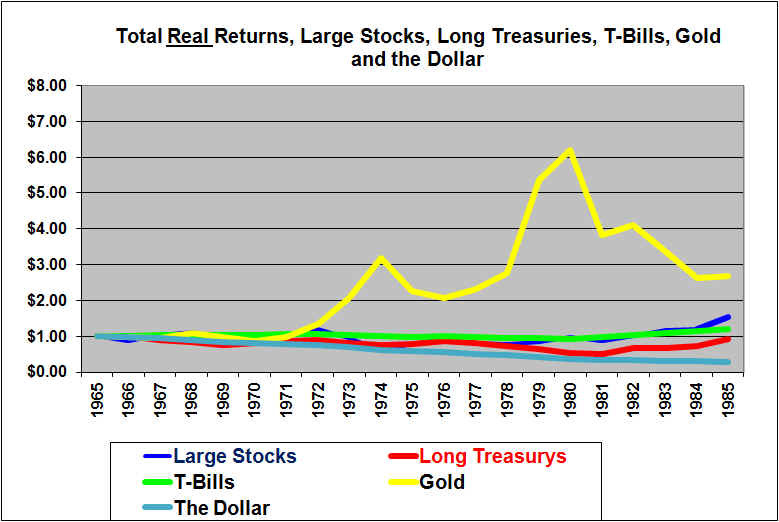 In real-dollar terms (adjusted for inflation), large U.S. stocks have absolutely walloped long government bonds, short-term cash investments, Gold, and the dollar itself in terms of total growth or return. 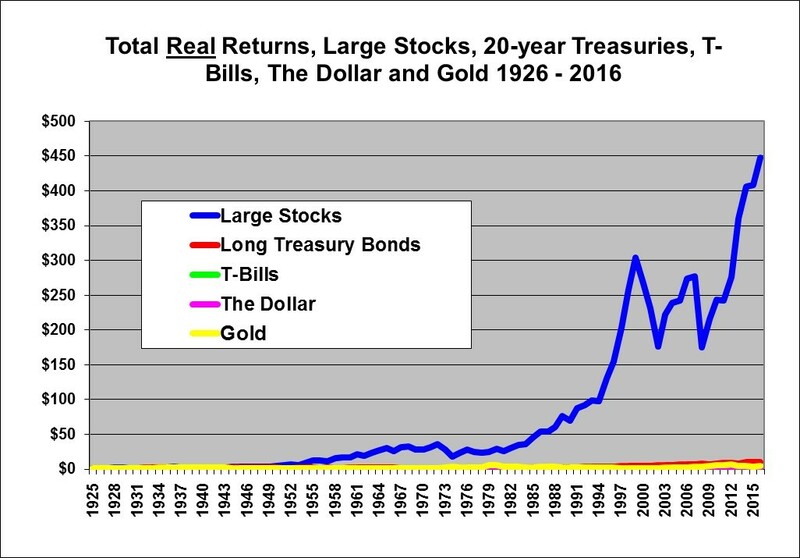 Each dollar invested in large stocks at the end of 1925 was worth $448 in real (inflation-adjusted) purchasing power 91 years later at December 31, 2016. Compared to large stocks, the other asset class values after 91 years are, comparatively, so low that they barely show up on the graph. (We’ll fix that below.) $1.00 invested in long-term U.S. government treasury bonds for those same 91 years was worth $9.98 at the end of 2016. $1.00 invested in T-Bills in 1926 was worth just $1.53. $1.00 invested in Gold for the 91 years was worth $4.12 at the end of 2016. $1.00 left literally in cash and not invested at all is now worth just 7 cents, due to the ravages of 91 years of inflation. Remember, all figures are after adjusting for inflation (and so the above figures are the growth in real purchasing power) and assume reinvestment of all dividends or interest received and also assume tax-free and no-fee investment accounts. After tax the growth would be less dramatic but would be even more in favor of stocks given the lower tax rates on capital gains and dividends. However since the Gold held for the 91 years would attract no taxes and no transaction fees it would improve relative to stocks if those were taken into account. This means that if your ancestor had foregone just 1 case of beer at the end of 1925 and invested the money, assuming it were possible, in a tax-free account, in the S&P index of large stocks (and reinvested all dividends and rebalanced to stay with the index over the years, and ignoring transaction costs), then you, as heir, as at December 31, 2016, could go out and buy 1 case of beer and still have money enough left to buy 447 more cases! This is truly amazing and is really a case where you can in fact have your cake and eat it too, if you just delay eating the cake and instead invest the money for a long time. Later I will show that there are some pretty good returns over 20 year periods, so you don’t have to actually invest for 91 years!. This amazing out-performance of stocks (which beat long-term government bonds by a factor of $448/$7.11 or a staggering 63 to 1, in the 91 years) has occurred in spite of the two huge stock crashes that have occurred since the year 2000, not to mention the stock crash of the great depression. The stocks also clobbered Gold by a factor of $448/$4.12 or a withering 109 to 1. The T-Bill investment at $1.53 has just barely kept ahead of inflation. And a dollar kept literally in cash as in a safe deposit box or under a mattress still is the same dollar but it now buys only what 7 cents would have bought in 1926. Cash in a safe deposit box is a wasting asset, over longer periods of time, in the presence of inflation. The above graph which has a normal linear (arithmetic) scale does a great job of showing the huge difference in the ending portfolio values but unfortunately is horribly distorted in four ways. First, the results from the earlier years are not really visible. Second, it looks like the percentage rate of growth for stocks was increasing toward infinity until 1999 and also since about 2011. Third, on this graph it looks like the early 2000’s stock crash was by far the biggest market crash ever. Fourth, the very strong performance of government bonds and Gold in recent years is obscured and is not even visible. A logarithmic scale solves these problems because a constant percentage growth appears as approximately a straight line and the percentage gains in the earlier years are much more visible. Also the large gains in Gold and bonds in recent years will become visible. Unfortunately a logarithmic scale tends to somewhat obscure the huge differences in the ending values. When viewing a growing data series it is essential to to view it with a logarithmic scale in order to properly understand the trend and the volatility over time. A regular linear arithmetic scale is useful for showing the total growth achieved in the end but horribly distorts the trend and the level of volatility across time. The longer the time period and the higher the average annual percentage growth, the worse the distortion. The same data presented in the above graph is presented below with a logarithmic scale. 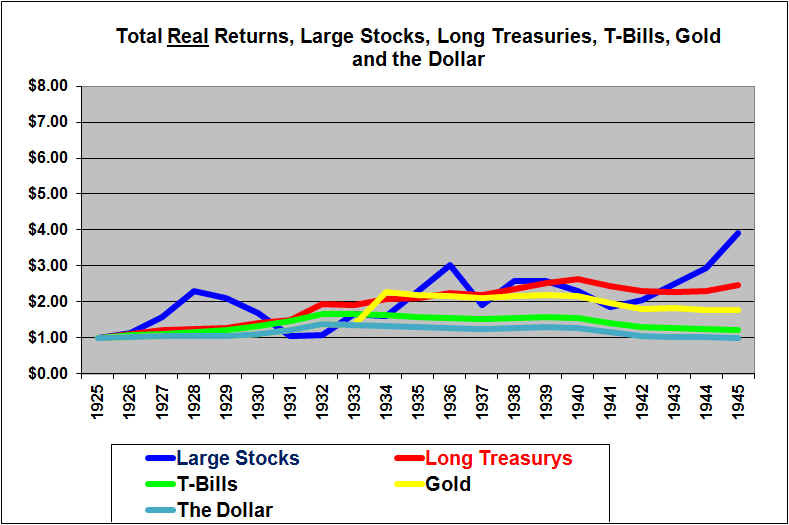 In this graph (with the same data as above) you now have to look more closely to realize the amazing extent to which large stocks (the S&P 500) outperformed Treasury bonds, T-bills, Gold and the dollar itself over the 91 year period. But this logarithmic scale allows you to properly view the trend and volatility over the years. A constant slope on this logarithmic graph represents an approximately constant annual percentage growth. By the nature of logarithmic graphs, a dip or gain on this graph of a certain height represents the same percentage change whether it happened in the 1920’s or the 2000’s. Any dip or gain visible on this graph is actually large since a logarithmic scale tends to make even large percentage changes look small. This graph reveals that large cap stocks (the blue line) were much more volatile than bonds, particularly from 1926 – 1932, the mid 70’s and in the 2000’s to date. Again, remember that the graphs show real returns, adjusted for inflation. It is interesting that the big stock market crash in 1987 is not apparent on this graph. The reason for that is the fact that the graph here shows only year-end figures. The big crash in 1987 was actually an event that happened within the year as stocks soared until October that year and then crashed. On a calendar year basis U.S. large cap stocks were actually up slightly in 1987. The Graphs below take the data above and break it out into 20 year periods and reveal some very interesting insights into asset performance in different periods. Note that the scales below are linear (as opposed to logarithmic) and that all the scales go to $8.00 (A 700% gain, from the $1.00 starting point). A linear scale is acceptable here given the relatively short time period. By using the same scale it is easier to visually compare the performance across the different 20 year periods. Long Treasury Bonds (the red line) look like the place to be in the 1926 – 1945 period. Stocks beat out Bonds in the end but it was a rough ride indeed. The stock index returned 291% after inflation in the 20 year period while the Treasury bond index returned 148% and Treasury bills eked out 22%. Gold gained 78% in real terms. The gain in Gold was due to a U.S. devaluation of the dollar from 1/20th of an ounce of Gold to 1/35th of an ounce of Gold in 1934. A paper dollar in a safe or under a mattress gained in value during the depression due to deflation and ended up losing just 1.5% in purchasing power over these 20 years. (And that was despite the devaluation in terms of Gold which apparently had no impact on inflation inside the United States). Notice that the dollar exactly tracked Gold (or was it vice versa?) until 1934 which was when the U.S. government forced citizens to turn in their Gold for $20.67 per ounce (so called expropriation, but they did pay for the Gold, but the former Gold holders lost out on the appreciation in Gold that came soon after it was expropriated) and then the government effectively devalued the dollar by redeeming U.S. $35.00 dollars from foreign banks in exchange for one ounce of Gold as opposed to the former $20.67. ($1000 therefore that used to “buy” 48.4 ounces of Gold would then buy only 28.6 ounces due to the devaluation of the U.S. dollar in terms of Gold). The value of a dollar fell sharply relative to Gold in 1934 but then parallels gold for the remainder the period shown in this graph. The (relatively) unique thing about this time period was the huge stock valuation bubble in the late 20’s followed by a bursting in late 1929, which was then exacerbated by poor government policies that led to the Great Depression. Note that the full extent of the stock bubble and crash is not visible in this graph because it uses only year-end, rather than daily data. Wow, 1946 – 1965, what an incredible run for stocks!, while bonds and T-Bills and Gold all failed to even keep up with inflation. The dollar itself fell in real value due to inflation. It’s interesting to note that stocks would be considered to be much more risky, because they increased in a volatile fashion while bonds were pretty flat and went nowhere. But if this is what people call risk, I’ll take it! The stock index returned a whopping 664%, after inflation, while the long bond index investment lost about 21% and even so-called risk-free Treasury bills lost 16% after inflation, over the 20 years. Gold lost 46% in real terms and the dollar itself lost a similar 43%. Gold was tied to the dollar because the U.S. government would (for foreign governments) redeem dollars for Gold at a fixed $35 per ounce, hence the similar loss. Whenever you look at long term data that shows the huge margin by which stocks have beaten bonds, it is wise to remember that a huge chunk of that came from the 15 years after 1949. During this period there was moderate inflation, in contrast to the deflationary 1930’s. Long-term bond rates did not appear to reflect an expectation of even moderate inflation. Stocks were able to keep up with inflation, (in fact far out-paced inflation) while long term bonds got hammered due to unanticipated inflation. The post war years also saw unprecedented gains in productivity and the birth of the consumer society. This benefited stocks, hugely. We should not expect these factors to be repeated in future. The 1966 to 1985 period included an incredible run for Gold from 1972 to 1980. But, ouch!, this was an ugly time to be an investor in stocks and bonds. Note that the scale extends to $8.00 so that the graph can be easily and properly compared to the 1946-1965 graph above. These were the really big inflation years and both stocks and bonds as well as treasury bills had a very hard time keeping up with high inflation. The dollar itself lost an ugly 71% mostly due to the famously high inflation of the 1970s. 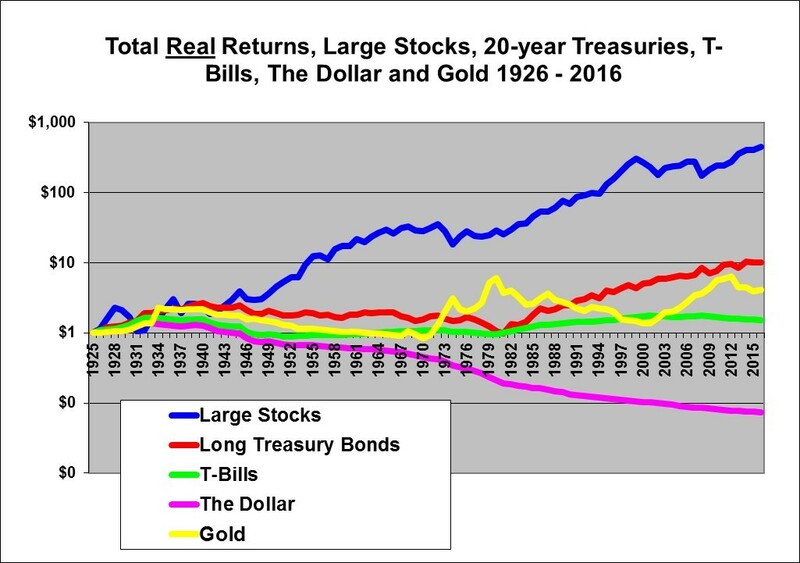 It does not look like much, but stocks returned a total real portfolio gain of 53% over the 20 years while long bonds lost 7% and Treasury bills made 20%. Both stocks and bonds were volatile and both had periods where they dropped about 50%. T-bills were looking good with low volatility and reasonable returns compared to the other assets. But Gold, was the place to be. It continued to track the dollar until President Nixon took the dollar off of the Gold standard in 1971 and then Gold soared in dollar terms. From 1972 to 1980, Gold did a LOT more than keep up with inflation. At its peak it had risen about 500% in real buying power terms even after adjusting for the big inflation. Next we look at the period from the end of 1985 through the end of 2005. 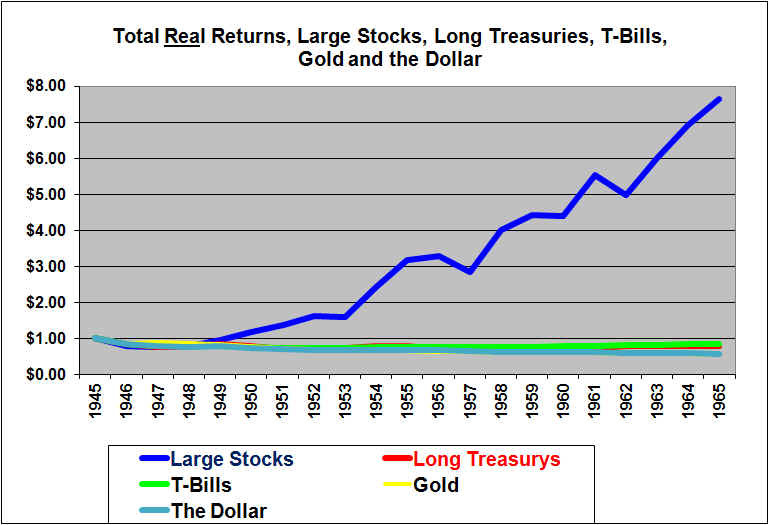 $1.00 invested in large stocks at the end of 1985 was worth $5.29 at the end of 2005 for a gain of 429% in real after-inflation terms. This was in spite of the stock crash of the early 2000’s. The gain in stocks from 1985 to 1999 was similar to the gains from 1949 to 1965. The 20-year gain for Long Bonds was $3.15 (215% gain) and for T-Bills was $1.36 (36% gain). Gold did not quite hold its purchasing power and was down 13% in these 20 years. $1.00 invested in gold at the start of 1986 had fallen to an inflation-adjusted 54 cents at the end of 2000 but then roared back to 87 cents at the end of 2005. The purchasing power of a cash dollar fell by 44%. A very distinctive thing about the period of 1986 through 2005 was a huge drop in interest rates. This provided a huge boost to bond returns. It also contributed to higher P/E multiples being justified for stocks, which boosted stock returns. Another relatively unique thing about that period was the huge stock valuation bubble of the late 90’s which then deflated and then partially recovered. In order to cover the 20 years ended December 31, 2016, our next graph will significantly over-lap the one just above. In the 20 years from the start of 1997 through 2016 stocks once again beat out bonds. Bonds however were less volatile. $1.00 invested in large stocks for the 20 years since the start of 1997 (end of 1996) was worth $2.89, in real terms after inflation, at the end of 2016. For 20-year long-term government bonds the figure was $2.62 and for Treasury bills $0.92. Gold at first did poorly but then surged from 2001 to 2012 and $1.00 invested in gold grew to $2.04 although it peaked at $3.11 at the end of 2012. The purchasing power of a cash dollar declined 34% in these 20 years to 66 cents. Gold-bugs will be moderately pleased with this last graph since it shows that Gold has dramatically out performed stocks since the start of the year 2000 and also moderately out-performed 20-year government bonds. I changed the scale here to a maximum of $4.50 to better show the out-performance of Gold and to better show the stock declines. 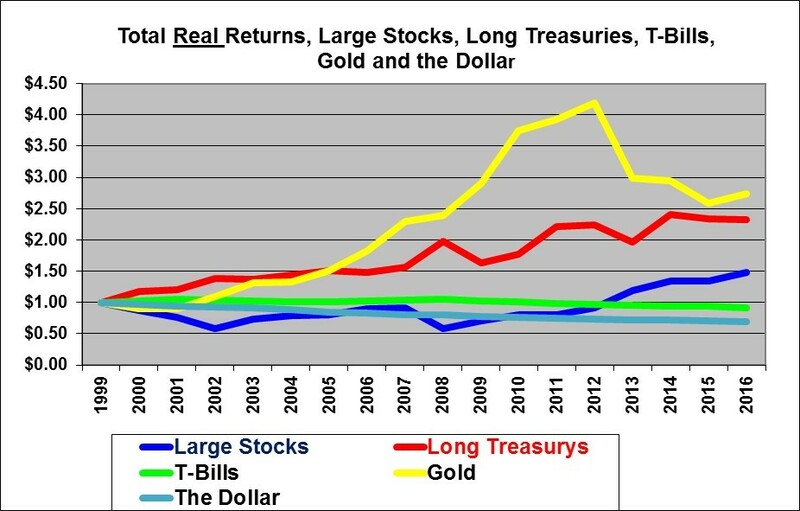 Those who have soured on stocks and who love gold always focus on the relatively poor performance of stocks versus Gold since the year 2000. But, we should remember that the world did not begin in the year 2000 and so it is a bit unwise to obsess about stocks’ poor performance since that peak in the stock market to the exclusion of all other time periods. The above graphs demonstrate that the market looks very different in different time periods and it is therefore very dangerous to make assumptions about the relative performance of stocks and bonds in the next 20 years. By studying these graphs, you can draw your own conclusions about the relative returns and risks of Stocks, Bonds, T-Bills and Gold. And you can see the decline in purchasing power that occurs with actual cash held in a safe or in a mattress for 20 year periods. Note that these total return indexes ignore taxes (effectively assumes a non-taxable account) and also ignore trading costs. Stocks (the S&P 500) out-performed 20-year government Bonds and T-bills and Gold by an absolutely staggering amount over the last 91 years. Stocks therefore also did a far superior job of protecting against inflation over the full 91 year period. Stocks even out-performed over the 20 years from 1926 through 1945, in spite of the depression and crash of 1929-1932. Bonds also did reasonably well. T-Bills were basically the after inflation equivalent of stuffing cash under the mattress. Gold did reasonably well over the full 91 year period but was highly volatile in terms of purchasing power. Actual cash in a mattress basically rotted away due to high inflation in some decades. For the 20 years from 1946 to 1965, stocks were far superior. Bonds and T-Bills imitated mattresses (but did protect against inflation, although not fully). The dollar itself and Gold which was tied to the dollar both lost almost half of their purchasing power. The 20 years from 1966 through 1985 were ugly all around (unless one held Gold). Stocks came out slightly ahead of bonds. Gold had very large returns as it was de-coupled from the U.S. dollar and as Americans were again allowed to own it. During the 20 years ended 2005, Stocks did very well but with high volatility, Bonds did unusually well compared to stocks and with a lot less volatility. T-Bills continued to only slightly out-perform inflation. Gold slightly trailed inflation. In the 20 years ended 2016 stocks once again won out. Gold also did very well over these 20 years but trailed stocks in the end. Finally, if we focus on just the 17 years since the turn of this new century, which also coincides with the 17 years since a stock market peak (bubble), stocks performed relatively poorly in that period. Gold was the winner and 20-year government bonds also did very well. A major learning from the above graphs is that the markets look very different in different time periods. It would be foolish indeed to base your investment decisions solely on the results from the last 20 years or so. Those two decades were unique due to a combination of low inflation and declining interest rates. Long-term interest rates probably can’t get much lower and so the next 20 years is sure to look far different than the most recent two decades. It would be even more foolish to base your investment decisions on the poor performance of the stock market since its bubble peak 17 years ago. The above data and graphs focus on just four investment periods beginning at the end of 1925, 1945, 1965, and 1985 (plus the over-lapping period beginning at the end of 1996 and the 17-year period from 2000 through mid 2016). Given the significant differences in the performance of stocks, versus bonds or T-bills and Gold over those different periods, it is very useful to look at the comparison over all the possible 10 to 30 year holding periods beginning each year since the end of 1925. My related article does this by graphing the average annual returns over all those possible holding periods and attempts to answer the question of whether stocks are really riskier than bonds.